This seems to have been cooking all day, and I struggled to find a pot large enough to house all the vegetables, but it was well worth it for the finished product. 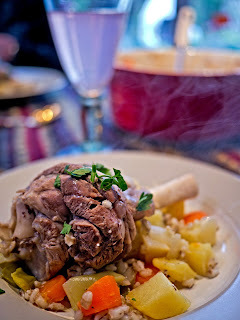 Place shanks and barley in a large oven-proof pot and cover with stock. Bake at 160°C for 1.5 hours. Add the vegetables and return to the oven for a further 1.5 hours. Remove the juices form the pan, keeping the meat and vegetables hot, add the Bisto powder to the pan juices and heat to thicken, adding more water if necessary. Serve the vegetables on a plate, topped with the lamb shanks. Serve the gravy separately, and mint sauce is desired.